htoL#NiQ is a puzzle game where you must lead a little girl through deadly obstacles by using two different fireflies. No, I'm not sure how to pronounce the title either, so it's easier to call it by its subtitle, The Firefly Diary. As mentioned before, the game is primarily a puzzle game. The front touch screen is used to directly control the first firefly. Mion, the girl, will follow it to the best of her ability. Placing it above or below a ladder will have her climb it in the appropriate direction. She's really slow about getting to places, which can make it much harder to complete some puzzles. Granted, she is a little girl, but she seems very intent on not caring about the danger she's in. While there is the occasional scene where she somewhat hurries away from a scary monster, she mostly shuffles along while you wait for her to catch up and hopefully not die. The back screen is a much cooler idea. It controls a second firefly that lives in Mion's shadow. This firefly can hit switches and even enemies, but to travel to its destinations, the shadows must be connected so it can reach. The first firefly is a light source, so using both to compliment each other is necessary. Using the back touchscreen is very imprecise, which is a drag. The game needs some sore of precision, but it's just not possible when you can't see what you are touching. At least the game slows down when using the shadow firefly, otherwise it would be near impossible to use it effectively. There's also a cooldown period after exiting the back touchscreen, so it won't register you touching it for a few seconds afterwards. Combining those two negatives makes using it a lot harder than it should, resulting in me dying a lot. Well, not me, but poor little slow-walking Mion. Each stage is not very long, but will take awhile to complete, simply because of the nature of the game. It is very easy to fail. If Mion is brushed by just about anything, she will die a horrible death. There are a fair amount of checkpoints, but the game can get pretty hard. Probably less so if you are a regular puzzle game player. However, Mion's slow shuffle and fighting the touchscreen-only controls causes a big rift between knowing how to complete a puzzle, and actually being able to do it. I personally find that to go against the point of a puzzle game, since figuring out what to do should be the hard part, not trying to get through it because of iffy controls. With enough trial and error, it is possible to make your way through the game, though I suspect more than a few will give up partway through... and I can't blame them. 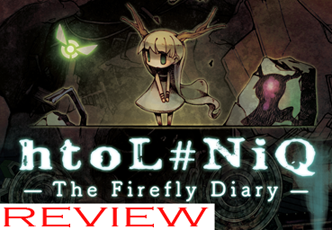 htoL#NiQ: The Firefly Diary isn't necessarily a bad game, as visually the game is very charming, but it could be much better. I'm really not a fan of touchscreen only controls, and this game did nothing to change that. Supposedly there is a patch that will add actual controls, but I'm not sure that will save it. It won't fix the disconnect with getting her to move, since you don't directly control her. I'm not a fan of puzzle games, so if you are, you might like the game. After putting up with trying to get Mion to move anywhere with any kind of haste, I was fine with her meeting yet another grisly end while trying not to lose my sanity. Hand of Fate seeks to combine the dungeon crawling and combat of an action RPG with the "luck of the draw" nature of card games into a cohesive whole. Admittedly, it seems like a tall order, but it actually works out pretty well. The game is divided into small campaigns that span one dungeon each. The encounter cards you put in your deck are added to a few the deckmaster (that's what I'm calling the mysterious person you play against) throws in and then are shuffled together. Each floor of the dungeon will be a few of these cards laid out in a pattern. You can choose any adjacent card to move to, even if it is uncovered. Moving costs 1 food, but restores 5 HP. If you have no food, moving loses 10 HP. Considering your starting health is 100, starving hurts. When you move onto a face-down encounter card, it is flipped up and you have to deal with whatever it is. Many times it is a fight against a few opponents. There are also areas filled with traps that you can negotiate for treasure, or even wandering merchants and other scenarios that require you to make a choice. Sometimes the choice is a simple choose an answer and the rest of the time you must choose a Chance card. Four cards are taken from the pool (Huge success, success, failure and huge failure), shown to you, flipped over, moved around, and then you choose. It's sadly not as easy as the "guess which cup the ball is under" mini-games that I've played before, since they all move together and then spread out, making it hard to actually follow one. I guess it makes it more fair, but since I'm good at those, it makes it harder to get a good result. Some encounters and treasures will reward you with money, food or even equipment cards. The equipment cards are, like the encounter cards, chosen by the player and mixed with a few from the deckmaster. They can be weapons, armor, a shield or even an artifact that grants you a special move. Before you start any campaign, you choose (within deck limits) which encounter and equipment cards you put into your decks, so you can tailor it to your playstyle. The game will also recommend cards for you, if customizing a deck isn't your thing. I usually let the computer do it, then tweak what they suggest to make a quick custom deck. Enemy cards will tell you how many and what type of enemies you will be fighting. Fights remind me a lot of the Batman: Arkham games, at least when you have a shield equipped. You can attack and dodge, and having a shield will let you counter an opponent (when they have a mark above their head), and use a stun attack to stop them from blocking. However, unlike the Arkham series, it pays to be aggressive. It's much more efficient to attack enemies, then counter or dodge as necessary to cut them all down. Combat in Hand of Fate is a good middle ground between counter only and hack and slash. Making your way through the encounter cards will eventually end up with a staircase or cart card that will take you to another "floor" of the dungeon. Sometimes it isn't necessary to uncover every card, but successfully defeating one for the first time will unlock various reward upon completion of the campaign. At the end of the last floor, there is a boss you must defeat. Doing so will grant you many rewards, such as new encounter and equipment cards. The cards are yours to keep even if you fail the dungeon, so prioritizing them can make subsequent runs easier. After beating three bosses, you get a permanent starting bonus card as an extra reward. So while death may send you to the start of each dungeon, choices you make can make it easier to do another run. Each subsequent dungeon takes longer than the previous, and there are 12 to make your way through. Getting partway through the game also unlocks an endless mode. The game isn't too difficult, but the random nature of what cards you get can make some trips much harder than others. I'd say it's easily worth the $20 they are asking for. The achievements might take awhile, since you have to get all the cards, and even get really lucky for a few of the achievements. I recommend Hand of Fate to any RPG or action RPG fans. It replicates the random nature of pen and paper RPGs really well by using a deck of cards as a dungeon. The idea is cool and more importantly, it is pulled off really well. My biggest problems with the game are sometimes the random nature can make a dungeon much harder than it should be, and that the game wasn't too clear when it was saving, making me hesitant to quit playing the first time. It can also get really choppy while it is loading, but the game is well worth checking out. Citizens of Earth has arrived on a multitude of platforms. It is very humorous, but not as politically leaning as one might expect. Sure, there is some political humor, but most of it is just jokes and puns, so no worries about it offending the red or blue halves of the country. You start as the newly elected Vice President of the World, and must recruit citizens to fight for you as you uncover the meaning behind some bizarre happenings. That might sound a little vague, but the story is pretty good and I don't want to spoil it for anybody. The VP doesn't do his own fighting, so the citizens do it for him. Your party (for fighting!) consists of up to 3 citizens. Battles are turn based, with each citizen and opponent normally getting one action per turn. Instead of having an MP-based system for abilities, there are energy bubbles. Actions will either give or take energy. Basic attacks and some self-buffs give them, while stronger attacks, elemental attacks and things like healing will take them. There's a nice balance to juggling your actions to dish out damage, but saving some energy for harder foes... or the always useful healing. The energy bubbles and status effects persist after battle, too, which is a nice bonus. The game also seems to take a cue from the Persona series, in that it will reward your for striking an enemy's weakness, but punish you for hitting their resistance. Exploiting a weakness will grant an additional energy bubble, while the enemy resisting your attack has the opposite effect. The system is pretty easy to take advantage of. Even if you spend energy to do an elemental attack, you will get it right back. To balance it out, not every enemy is weak to something, so use it whenever you can for some easy victories. The side of the battle screen shows the order for the next turn, but unfortunately only shows your side. The only real complaint I have about the battles is the VP's commentary. Occasionally he'll say something, usually a reaction to a critical or taking a nasty hit, but the battle has to pause while the voice clip plays. I assume that is to prevent overlapping dialogue, but it slows down the fights and is a little irritating after awhile. Enemies are visible on the field, so you know when you are going to get into a fight. Normal rules for visible enemies apply, so if you can catch them from behind, you get a bonus energy bubble. Getting ambushed will take one energy away. It's surprisingly hard to get the preemptive strikes, at least for me. If you are stronger than the enemies, you can win the battle instantly and gain a small portion of the experience the enemy would have given. That's what usually happened when I got the drop on an enemy. However, it's easier to get ambushed, since contact with any citizen in your party will trigger combat. Trying to run away from an enemy on the field can easily get you ambushed, since you have to be aware of the train of people following you. Also, if you make your citizens charge (square button on the field) and they miss, but hit the enemy in the back while returning, you get ambushed. Yeah, I don't know why either, since you clearly got them in a pincer attack. It's pretty rare, so I guess it's not an issue, but something to be aware of. Moving around the fields is easy, and there are gifts to pick up (treasure chests), and things to search, like bookcases. I like that examining many things for the first time will award your party with a small bit of experience. Just be careful wandering around the maps, since you can wander into places you aren't strong enough for. There are also some places that are blocked off, and certain citizens are required to gain access. I think it's an interesting way to block stuff off, while not feeling like gated progress. Want to cross that gap to be able to go somewhere else? Recruit the architect and pay her to build a bridge. Need through that broken door? Recruit the handyman to fix it. It fits really well with the theme of the game, and I really like that the citizens have more uses than just fighting. There are other non-battle uses for citizens. The car salesmen will let you use his car to quickly navigate the roads. The pilot can help you warp around the map. The lifeguard will allow you to breath underwater (just go with it, ok?). One of the most useful is the Yoga Instructor. She lets you level down and gain bonus points to distribute to whatever stats you see fit. It's a much softer version of reincarnation from the Disgaea series, and it's awesome. It's also really powerful if you abuse it, so if you want the game to be hard, stay away from her. Also, her and many other citizens don't have to be recruited to use their functions, but you will have to track them down to do so. Otherwise, using their abilities, changing their piece of equipment, or swapping around your battle party is pretty easy to do from the menu. The length is pretty good, and clocks in at about 30 or so hours for the story. Of course you will get more time by wandering around and trying to get all the citizens. There is no platinum, much to the dismay of trophy hunters. There's not really much replay, either, since you can't really miss anything that I know of. Still a good value for the dollar, though. I'll also note that some people have had some issues with the game freezing/locking up on them. I personally had none, even in the places described, and I played it in spans of several hours each. So regardless, I'll still advise you to save often, and use the three slots they give you to the fullest. I would, of course, like more than three, since I'm a save-a-holic, but I can make do. Citizens of Earth is a charming RPG. If you like unique and quirky games, and turn based battles, definitely try the game out. I've seen it favorably compared to Earthbound, but I'd also add it takes a few cues from other games, too, and gives the user a fun and unique experience. I was also surprised that it ran well on my four year old mid-range PC, so if you don't have the necessary consoles, you can easily enjoy the PC version.